Some of the few differences between these two machines come down to interactive systems like the virtual integrated programs. The T9 does have the virtual integrated programs while the T7 does not. But a few additional programs don’t seem to justify the higher price point. While the Elite T9 is not a bad machine, it just isn’t worth the price. If you are interested the T9, check out our T7 review, as they are virtually the same machine. The Elite T9 treadmill is priced at $1,899. Want more tech - The Elite T9 has more tech built in than previous Horizon treadmills like the Elite T7. With a 10” touchscreen, smartphone compatibility, and more programs, the T9 offers more tech than has been seen in Horizon treadmills. 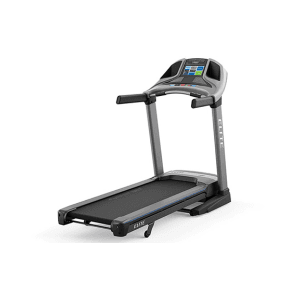 Need compact treadmills - Many treadmills in this price range become bulky to accommodate more features, like the x11i incline/decline features. The T9 is a slim machine which will fit easily into smaller homes. Have moderate treadmill needs - The T9 is best suited for walkers and joggers. Its 2.75 CHP motor is up to daily use but may not be up to serious runners using it daily. Smaller motor size - The Elite T9 has a much smaller motor than comparably priced treadmills such as the Sole S77 with its 4.0 CHP motor and NordicTrack x11i 4.25 CHP motor. Comparing those powerful motors with the 2.75 motor in the T9 does not reflect well on the T9. Less running area - With 20” by 60”, the T9 offers plenty of space. However, the S77 and x11i both are 22” by 60”. Expensive with little upgrade - As mentioned earlier, there isn’t much difference between the Elite T7 and the Elite T9. But there is over $400 difference between the two treadmills. The one saving grace of the Elite T9 is the features. They range from good to interesting, in addition to the optional add-on Passport programs. Footprint In Use (W,L,H): 36" x 77" x 60"
Footprint Folded (W,L,H): 36" x 44" x 69"
Motor Size - The motor in this treadmill is 2.75 CHP. This is surprisingly low, considering the other treadmills in the Elite T9 price range have much bigger motors. The S77 has a 4.0 CHP motor and the x11i has a 4.25 CHP motor. Running Area - The running surface is 20” by 60”. The Elite T9 is 2” shorter in width than the S77 and x11i, which are both 22” by 60”. This can be important for those who want a little extra arm room but should not be an issue for most users. Weight Capacity - The T9 can hold users up to 350 lbs in weight, which is 50 lbs more than the x11i can handle. For heavier users, the ultra-sturdy SOLE treadmills can generally hold more, such as the S77, which can hold up to a 400 lbs user. Folding - When folded, the Elite T9 is 36" wide, by 44" long and 69" high. It is a fairly compact machine and can be easily moved. Space / Footprint - When in use, the T9 is 36" wide, by 77" long, and 60" high. It is a slimmer machine than the x11i and shorter than the S77, which can be helpful for users who don’t have much space. Keep in mind, its dimensions are the exact same as the previous model, the Elite T7. Max Speed - The treadmills max speed is 12 MPH, an industry-standard for this price point. However, while the Elite T9 does not have the same frustrating speed/incline interface as the earlier machine (Elite T7), it does not have intuitive speed/incline adjustment. Instead, it relies on a keypad, where you need to input the speed you want and then need to select the check mark for the treadmill to change speed. This can be dangerous if you are running and need to slow down. Our testers found it difficult when running to maintain their pace while using the keypad interface. While there are up/down arrows that allow for speed adjustments, these will only take the speed down in small increments (7.5, 7.4, 7.3, etc). Incline - This treadmill has an incline range of 0% - 15% which is the same incline range offered by the S77. Both are blown out of the water by the 40% incline the x11i can achieve (not to mention the -6% decline). The incline interface is the same as the speed interface but it is less of a problem if you can’t change inclines quickly. Workout Apps - The programs for the Elite T9 are one of the few areas this treadmill differs from the Elite T7. The virtual integrated programs are used with the Passport programs, which are sold separately from the T9. The Passport system lets you run in areas around the world, giving you high-definition views. With the virtual integrated system, your treadmill will automatically adjust to reflect the surrounding, changing speeds and inclines without your input. However, you have to purchase the Passport programs, which come on USB sticks. Display - The Elite T9 has a 10” HD touchscreen, which is the same size as the x11i. It does make using the T9 a bit easier than the T7. It is a bright and color-rich screen and one of the high points of the T9. Speakers - The speakers are decent on the T9 treadmill. They lack bass, like most Horizon treadmills, and become tinny just beyond the halfway volume point. Fans - The Elite T9’s fan is not very powerful if you are working out at a moderate intensity, but you can change the direction the fan is pointing. That is a helpful feature lacking on many treadmills. Heart Rate Monitoring - There are handlebar heart rate grips on the T9. But this type of heart rate monitoring isn’t very accurate. However, the Elite T9 treadmill comes with a Polar heart rate monitoring chest strap which is much more accurate. ViaFit Connect - The ViaFit Connect app is Horizon’s app for its treadmills. Track your workouts and share them if you want. There isn’t much offered with this app, unlike SOLE Fitness app and iFit. With the SOLE app, you can not only track workouts, you can also control your treadmill from your machine. With the iFit, you have more programs to use with your machine, coaching, workout tracking and more. USB port - If you decide not to purchase the Passport programs, you can still use the USB port to plug your MP3 player into the T9 console. Water cubbies/device holder - The 2 water cubbies also double as device holders. Unlike the S77, which has a device holder located just under the console. The Elite T9 features are the best part of this machine. While it lacks in other areas when stacked up against competitor's treadmills, the features offered with the T9 help it not be a terrible machine. Warranties - Lifetime frame and motor, 5 years cushioning, 5 years parts, 2 years labor. Customer Support - Phone support for Horizon is Monday - Thursday 7:00 a.m. - 7:00 p.m. CST, Friday 7:00 a.m. - 5:00 p.m. CST. They also have an email address for additional support. Return Policy - 30-day money back guarantee, minus freight and assembly charges. While the Elite T9 has the weight capacity for a 350 lbs user, it does not look or feel like it. Our testers (heaviest was 220 lbs) found the T9 to be a little unstable when running at higher speeds. Users with heavier footfalls may want to look at the S77 if they want a sturdier treadmill. The molded plastic side rails seem fairly sturdy but a little slippery. If you sweat heavily, you may want to be careful when stepping on the side rails. We also aren’t sold on the 3-zone variable response cushioning. Our testers haven’t noticed a difference when it comes to striking the “different” zones. While the cushioning is comfortable while walking and jogging for most users, users rehabilitating injuries may find the deck uncomfortable after a short time using the T9 as one of our testers did. While the Elite T9 is a good machine, for the price of $1,899 it is not good enough. Both the S77 and x11i has better specs, features, and build quality while being comparable in price. If you want to purchase the Horizon Elite T9, we recommend you purchase directly from the manufacturer. It is less hassle than going through a third-party seller and you can be sure you are receiving the best price.